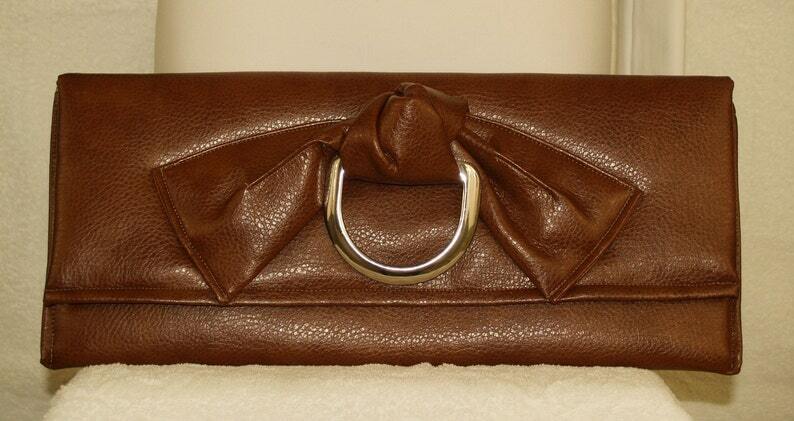 Brown High Quality Leather-Like Vinyl Fabric Handbag (with a pebbled finish). Unique, orginal envelope handbag with polished metal "stirrup" accent. This handbag is a little longer than most which creates a dynamic, eye catching, custom look. Handbag measures 18" long and 8" height. This handbag has a matching belt with is sold separately. A Divinely inspired creation. Silver Metallic Vegan Envelope Handbag with Pleated "Bow"